STREET SOCCER TO HOLD KENT SLEEPOUT AT PRIESTFIELD! The nationally acclaimed charitable organisation, The Street Soccer Foundation, has today announced it is to host its first ever #SLEEPOUT in Kent later this summer, at the home of Gillingham FC, Priestfield Stadium. The Foundation is calling on all business leaders, community leaders, owner/managers and executives, plus anyone who thinks they can raise a significant amount of money, from across Kent and the South East who want to help fight homelessness & poverty and youth unemployment across the region. The aim is to encourage a coming together of the local business community to help raise money and awareness for sleeping outdoors for one night: raising sponsorship from their business contacts and friends. 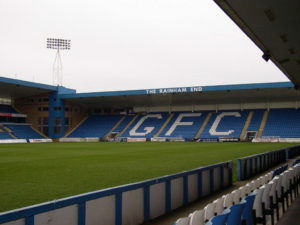 “Having discussed it with our good friends at Gillingham FC I’m delighted the Chairman and the team have given us the go-ahead and the support we sought to help us collectively, make a genuine difference to young people’s lives. The inaugural Street Soccer Sleepout hopes to raise lots of money but Keith stresses it’s as important to raise the awareness of the work the Foundation does to help homeless young people from across the County, including those at risk of becoming homeless. The Sleepout is planned to take place on Saturday 30th June at Priestfield Stadium from 8pm and business leaders are encouraged to sign up to take part to swap their suit for a sleeping bag and a Street Soccer survival kit come the night.